Well after a few months of driving the Hilux it was apparent that all was not well with the rear diff pinion bearing. It was howling and making terrible noises at highway speeds, it was so loud that you couldn’t talk to people in the back seat. One afternoon after a run out to Chris VK5CP’s shack at Younghusband I noticed oil coming out of the rear drivers side wheel, so it was now time to fix it. Upon undoing the nuts on the rear drivers side wheel oil began weeping from the threads, this was not going to be good. Yep just as I feared the inner oil seal had gone and diff oil had run throughout the drum brakes, bugger that’s got to be fixed now. 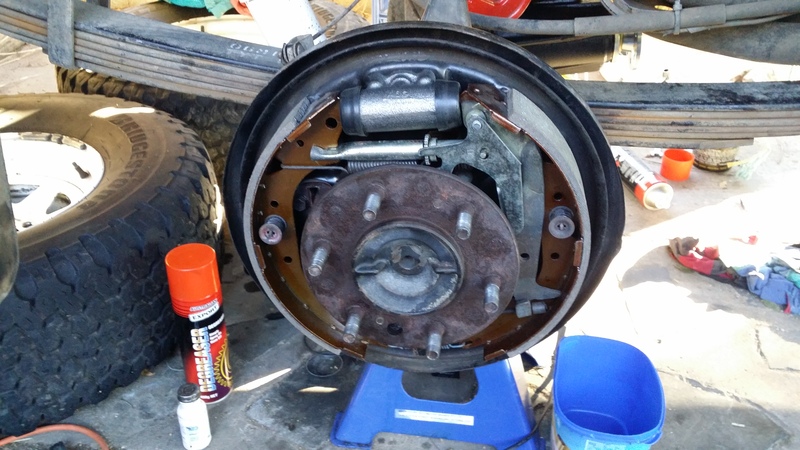 So once I’d removed all of the brake gizzards the drums were sent off to be machined, over sized brake pads radius-ed and new master cylinders obtained from the local brake repair shop. The tricky part of this diff rebuild was getting the axles out. They are quite different from my old Land Cruisers and I again phoned a friend Gary VK5FGRY to help me get it apart. After removing the brake lines (oh yay!) and four nuts the axles, backing plate and wheel bearings simply slide out as one assembly. The wheel bearings were also very growly, so off to the local mechanic with these since you need a press to do the job properly. Don’t forget to do both sides. Car stands and a trolley jack are mandatory to do this safely. Then the fun bit of getting the diff centre out. That is simply undo 12 nuts and then prepare your self for the heaviest close quarters bench press of your life. I still cannot believe how heavy the diff centre of the old Hilux actually is. Anyway once out the initial inspection suggested just bearings would be required, but alas no. As with all diff rebuilds they tend to be like an onion, once you start peeling the layers back your eyes water more and more. Anyway for the precision diff stuff I sent it to a local diff re-builder to be looked at. So a day later I get the dreaded call that tells me the surface hardening on the crown wheel and pinion was completely gone (worn away completely) and the spider gears were wearing on two faces instead of one. That meant a complete diff rebuild, new crown wheel, pinion, bearings, spider gears etc. Basically I’d given then a nice diff housing and carrier and well the rest was buggered. I guess after 410000kms it had simply had enough. “In for a penny in for a pound” was my Grandfathers favourite saying at times like this, I can still hear him saying it. So after an eye watering $2300 in materials I was ready to rebuild the diff once and for all. So the first job in rebuilding this diff was cleaning out the insides of the diff and to remove any previous traces of metal. So armed with tins of degreaser, white rags and a broom handle we mopped and cleaned the inside of the diff housing until it was as clean as a whistle. Then the fun job of wrestling the diff centre back into it’s position was tackled. All nice and black and shiny this time. I’ll admit installing cleaned parts that aren’t oily is always a nice change and a real turning point in any project. The new pinion that was installed in the new diff came with a larger input shaft, it’s now 41mm instead of 39mm. So that should be able to take the additional torque that the new motor puts out, so this diff rebuild is good in that respect. 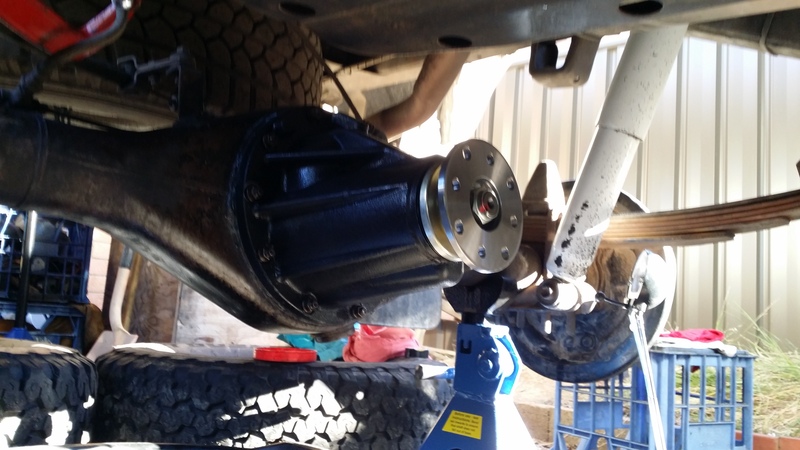 Once the diff centre is in the axles can be reinstalled and the brakes put back together. I really like the way in which Toyota prevent you from damaging the inner oil seals, hard to explain but the axles can’t hit the seal while your sliding the axle back in, it’s very ingenious and you’ll find out what I mean if you try it. I spent a fair amount of effort cleaning up all of the brake components and they won’t look like this the next time I service the brakes. 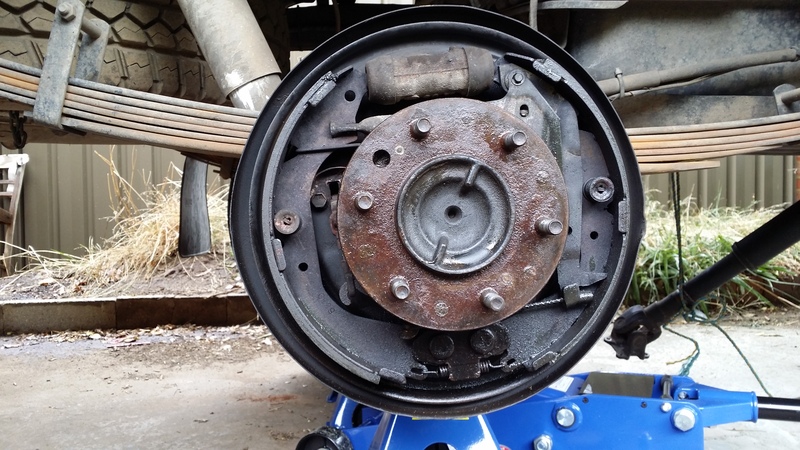 However the proof that I’d done a good job of the cleaning was when we simply used the handbrake to adjust the drum clearance. The winders when the handbrake is pulled will slowly wind the shoes out until they meet the drum. The tension between the winder and springs keep things tight and the clearances small, meaning when you step on the brake pedal they actually work. So from here it was get the other side done, reinstall the tail shaft and wheels, put oil in it and take it for a drive. Don’t forget the oil, bad things happen. 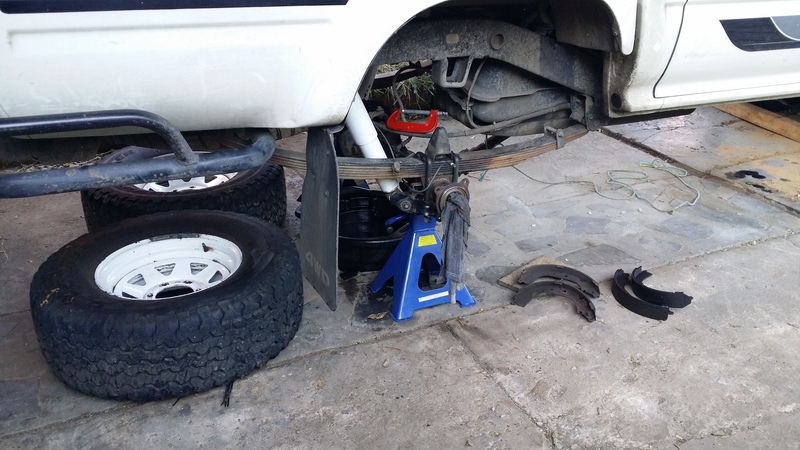 Again I’d have been lost without the assistance of Gary VK5FGRY, there is no limit to the things that I learn each time we repair this Hilux in some way. There’s not much of the insides of this old girl that I’ve not seen yet. I still remember the first time we drove it out and onto the street. About 100m down the road I say to Gary “do you hear anything” and the answer was “No”. Cool job done. So then the real fun of breaking in a new diff starts, being Mr Goody two shoes for the first 500kms, keep the speed down, don’t flog it up hills, no wide open throttle etc were obeyed. After 1200kms the diff oil was then changed (yes I was 200kms late). So far so good, there have been no subsequent leaks and the whole car has changed, it drives just like a new one. This entry was posted in General, Hilux and tagged 4.3:1, auto winders, axles, brakes, diff rebuild, pinion, wheel bearings by VK5ZM. Bookmark the permalink.